Hey everyone. As some of you may recall, I wrote a blog last year answering some of your questions, as well as questions people asked me on different Facebook groups. I answered as many as I could but in recent weeks, people have asked me more questions, so I thought it would be fun to follow up the first blog with another one. Disneyland Paris is such a big love of mine that I could quite happily answer questions about it all day, so there may even be more similar blogs like this in the future. Anyway, I hope you find my answers interesting, informative, and of course, fun! I'm going to begin with some questions about some of my favourite Disney things, other than the theme parks. What is your favourite animated Disney film? Now that is a very hard question. Disney are of course the best of the best when it comes to animated films. Like most children, I grew up watching Disney films with all of the family. I spent a lot of my younger years watching the likes of Snow White and the Seven Dwarves and Cinderella as they are favourites of my family. Having seen those two films so many times, I would probably say that they're my favourites too, especially when it comes to classic Disney animated films. I grew up in the 1990s, when Disney released quite a few successful films like Hercules and Aladdin, but I was never a big fan of them. Although not a typical Disney film for boys to like, I did used to love The Little Mermaid from 1989. I think I liked that one (and I still do, really) because of all the memorable songs in it. The most recent Disney animated film I have fallen in love with, like most people, is Frozen. I first watched it after it came out on DVD and instantly fell in love with it. What I like most about Frozen is it's catchy songs. Brilliant animation too. I'm sure Walt Disney would be proud! What is your favourite live action Disney film? Now this is another hard question for me, even harder than choosing a favourite animated film. Most children growing up with Disney films prefer the animated films, but I always preferred the live action Disney films. Looking back through the years, Disney have made many fantastic live action films, and still do to this very day. My favourite live action film, or should I say film series, would have to be the Herbie films. Growing up, I was absolutely fanatical about Herbie, the little volkswagen beetle with a mind of it's own. I would always try to buy toy volkswagen beetles wherever I could find them! The Herbie films have always been a favourite of mine and I think they will be for a long time. The first film, The Love Bug, is my absolute favourite Disney film of all time, no question. I would also like to give a special mention to Pirates of the Caribbean: The Curse of the Black Pearl. The first film in the Pirates series is undoubtedly the best one. I think Disney were spot on when they made this film. Johnny Depp as Captain Jack Sparrow was truly an inspired casting, and my word, it paid off didn't it! What's with these tough questions! Another hard one for me to answer but I'll give it a go. There are so many classic Disney songs aren't there. The soundtrack to my childhood was Disney songs. As I already mentioned, I used to love The Little Mermaid for it's songs, with classics such as Under The Sea and Kiss The Girl. I also love Frozen for it's many singalong songs. It's so hard to chose a favourite Disney song as there are so many, but if I had to, I think I would go with Let It Go, from Frozen. This is just such a classic already, even though it's only just over two years old. It's a really uplifting song, and probably the best sequence from the film. Idina Menzel's soaring vocals are just out of this world! If you had to work for Disney, what would your ideal job be? Wow, what a fantastic opportunity that would be! I think if given the choice, I would love to do something that would involve writing, very much like I do with these blogs. I'm very good with people though, so I think I would like to be a Cast Member in some kind. I would work in any of the parks, whether it be in Paris or America. If given the opportunity I would prefer to work in America. I think ideally I would like to be a professional blog writer for Disney. Who knows, if I keep this little hobby going, you never know what might happen! Have you got any future blogs planned? Oh yes, many! One of the things I love most about writing these blogs is knowing that I have built up a little fan base full of Disney fans. It's so lovely to know that I have fans of this blog that love my articles. Considering I started this as a little side hobby, it's so nice to know that there are people out there that enjoy my work, and I truly thank you all! I still can't believe that I have fans from all over the world. I would never have dreamed that I would have fans from countries as far away as Australia and Brazil! To keep the blog running, I always have a couple of blogs on the go at the same time. Currently in the pipeline are some hotel reviews, facts about Disney Village, and some blogs discussing my top 5 restaurants and shops at Disneyland Paris. Again, I really do appreciate everyone that reads my blogs! Now onto questions about my biggest passion, that's right, Disneyland Paris! What is your favourite section of the Disneyland Park? I would probably go with Discoveryland, although Frontierland is a very close second! I love the ambience of Discoveryland. The wonderful architecture, the inspiring music, just everything. Yes, I think it could do with some changes but I still love it. I think it's the most unique version of the Tomorrowland area to be found at any Disney park around the world. Discoveryland was inspired by the science fiction novels of Jules Verne, and the influences are very clear to see. Although it looks amazing in the day, it looks even better in the dark evenings. Like I said, Frontierland would be a close second, for a number of reasons. Just like Discoveryland, I think the Frontierland in Disneyland Paris is the best Frontierland around the world. It is unique because it is the only Disney park to have Big Thunder Mountain on an island in the middle of a lake. The version of Haunted Mansion, Phantom Manor, is also the best. This is one thing about Disneyland Paris that many people overlook, it actually features some very unique versions of attractions found in the other parks, as well as it's own unique attractions not to be found anywhere else. What is your favourite section of Walt Disney Studios? Although I'm a fan of the park, I'm not overly keen on some the theming at certain areas. In fact, I think the park lacks quite a lot of theming to be honest. Recent areas though, like Toy Story Playland and Ratatouille, would suggest that the park is getting better when it comes to theming, so positive signs ahead! I would have to say my favourite section of the park is probably the Ratatouille area. Although the section only features one ride and a restaurant, it's theming is immaculate! Which is your favourite hotel to stay in and why? I've been lucky enough to have stayed at four of the Disneyland Paris hotels. I have stayed at the Hotel New York, Hotel Santa Fe, Sequoia Lodge, and Newport Bay Club. I love all of these hotels for many reasons, which I will write in another blog soon. It really is a struggle to chose a favourite as I love them all for different reasons but as I have stayed there the most times, I would go with the Sequoia Lodge. I won't go into too much detail about why I love it as I am planning on writing a hotel review about it, but I think the theming here is exceptional. I also got engaged to my fiancee outside the front of the Sequoia Lodge, so it will always hold a special place in my heart for that. Which seasons have you experienced at Disneyland Paris and which one was your favourite? I've been lucky enough to have experienced the Halloween and Christmas seasons at Disneyland Paris. Both are equally as lovely in terms of theming but I think Christmas season would top it for me. As you'd expect, Disneyland Paris goes that extra step further for Christmas. In Disney Village, there are many Christmas stalls put up, where you can buy the likes of mulled wine and roasted chestnuts. 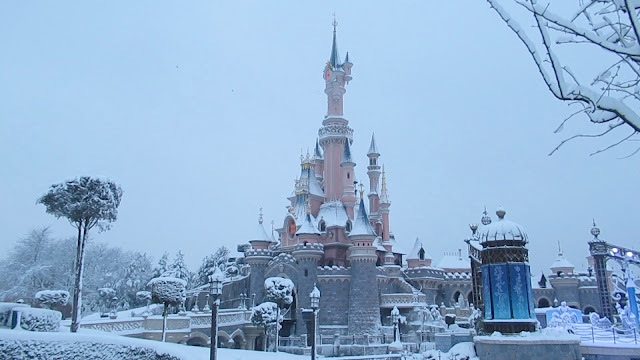 In the Disneyland Park, guests can experience snow every day when walking down Main Street during the Christmas special. Little things like this make Christmas that extra bit special for me. Don't get me wrong though, the Halloween season theming is fantastic, with lots of fun ghost and pumpkin people statues to be found around the Disneyland Park. Halloween season also provides guests the best opportunity to meet some of the Disney villains, whereas the rest of the year they are very rare to find in the parks. Which season do you most look forward to? I don't tend to visit Disneyland Paris based on the seasons but I would say I probably most look forward to the Christmas season, whether it be visiting, or watching videos/looking at photos of that time of year. Christmas is one of my favourite times of the year anyway, so visiting Disneyland Paris at Christmas time makes it extra magical! Have you met any rare characters at Disneyland Paris? 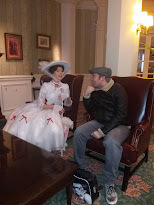 Sadly, I have never met any rare characters at Disneyland Paris. On my last trip I met many characters I had never met before but I wouldn't say any of them were rare characters to meet. The closest to rare characters I've met were the two ugly stepsisters from Cinderella, Anastasia and Drizella, and the two mice, Suzy and Perla, also from Cinderella. I would say that the two ugly stepsisters are quite rare to meet because they are not normally out and about in the parks other than during the Halloween season. They provided one of the best character experiences on my last trip, they were just hilarious! Suzy and Perla can be quite rare to meet walking about the parks, although you can quite easily meet them if you dine at Auberge de Cendrillon (Cinderella's Inn) at the Disneyland Park. You can also meet many of the princesses at the restaurant too. Which character would you like to meet in the parks that you haven't already? Now to be honest, I never thought I would be a fan of meeting the characters at my age (22) but I loved it on my trip last year. Me and my fiancee were so lucky with the amount of characters we met last year but there are still some I would really like to meet. I would love to meet Buzz Lightyear as I met Woody last year. I would also love to meet Winnie the Pooh, as he was one of my favourite Disney characters growing up. Having never seen any for meet and greets at either park, I would absolutely love to meet some characters from Star Wars! It would make my day if I could meet the likes of Luke Skywalker and Chewbacca! It would also be nice to meet some other princesses as well as they provide some of the best character interactions. It would be nice to meet Ariel and Belle. If you could choose any current attraction from another Disney park around the world, which one would you like to be built at either of the parks? The first one that comes to mind is The Great Movie Ride. I think The Great Movie Ride (from Disney's Hollywood Studios in Florida) is the perfect attraction that Walt Disney Studios really craves. If you're unfamiliar with the ride then The Great Movie Ride is a journey into the magic of the movies, with a guided vehicle taking you through many classic scenes from the movies, featuring audio-animatronics and lots of special effects. This classic attraction has been a staple of Disney's Hollywood Studios, ever since it opened on the park's opening day in 1989. While I agree that people could argue that The Great Movie Ride is similar to the already standing attraction at Walt Disney Studios, Cinemagique, it would still fit very well into the park, and I think it would be a success. Cinemagique, by the way, is my favourite attraction at both of the parks in Paris, so there is no way I would substitute it for The Great Movie Ride, I'd love them both! What would you say is the biggest difference between the Disneyland Park in Paris and the Magic Kingdom in Florida? There are too many differences to choose just one. I would like to note though that I think it is very unfair when people are negative when comparing both parks. People have to remember that Disneyland Paris is completely unique to the Magic Kingdom, and is not a carbon copy. While yes, there are many of the same attractions, both parks have their own unique attractions, especially at Disneyland Paris. I would say the most noticeable difference between the parks is the size. The Disneyland Park doesn't compare in sheer size comparison to the Magic Kingdom. The Magic Kingdom is a whole lot bigger than the Disneyland Park, so people have to realise how much space either park has to work with. There is still lots of space for the Magic Kingdom to work with but at the Disneyland Park in Paris, there is a big lack of space, whereas most of the land is already taken up with attractions and backstage areas. In all honesty, I don't think people should compare either park as they're so different. I think people should look at the positives of both. If you could make any changes to either of the parks and Disney Village, what would they be? Again, this is another subject I have dedicated a whole blog to but I will discuss some of the main ones. In the Disneyland Park, I would love to see Discoveryland given some more attention. Despite it being my favourite land at the Disneyland Park, I still think it needs some updating. The theatre next door to Star Tours that used to host Captain EO and Honey, I Shrunk The Audience could easily be remodelled into something different. One idea I had was for that theatre to be remodelled into a Star Wars themed restaurant based on the famous cantina scene from Star Wars: A New Hope. As Star Wars is so popular at the moment with the new film not long released, I think a Star Wars themed restaurant would be amazing, as well as being unique due to the fact there is not a Star Wars themed restaurant anywhere else in the world. It would be amazing for guests to dine in a setting, surrounded by Star Wars characters and aliens. Walt Disney Studios, as I already mentioned, just really needs some re-theming. Disney Village, my favourite thing at Disneyland Paris, isn't in need of any major changes. Many would say that Disney Village is the best it ever has been since it opened in 1992. One change I would make though would be to bring back daily concerts at Disney Village. I remember in the early 2000s that Disney Village used to host concerts on a daily basis every evening. This used to draw in huge crowds and I remember seeing many great bands there. I think it would be a great way to improve some of the night life at Disneyland Paris. Which bar is your favourite in the parks, hotels, and Disney Village? While there aren't any bars so to speak in the parks, my favourite place to sit down and relax with a drink is the Market House Deli, on Main Street USA in the Disneyland Park. This little venue serves up some very nice sandwiches as well as some lovely sweet treats like chocolate muffins for example. Hotel wise, my favourite bar is without doubt the Redwood Bar at the Sequoia Lodge! The atmosphere here is just so relaxing, especially in the evening after a busy day at the parks. I've never actually had an alcoholic drink at the Redwood Bar but I have always enjoyed sitting down and relaxing with a hot chocolate or latte. Cast Members at the Redwood Bar are just as exceptional as you'd expect. I'd also like to give a little shout out to the Rio Grande Bar at the Hotel Santa Fe. While it's probably the least themed bar at the Disneyland Paris resort, it's the most peaceful one. It's also one of the cheapest bars on site too. In Disney Village, the Sports Bar is my absolute favourite to grab a drink. I love the atmosphere here, especially when there is a crowd of people all watching the same game and cheering a team on. It is never rowdy there and always has a good family friendly atmosphere, despite it being a bar. The Sports Bar is definitely my favourite destination for a beer while visiting Disneyland Paris. Do you think Disney Village is missing any type of restaurant? Yes, definitely! As much as I love Disney Village, there is definitely an overabundance of American style food. King Ludwig's Castle is the only restaurant in Disney Village to not specialise in American food, instead specialising in German food. I think Disney Village should stick to a more European theme when it comes to restaurants, after all, most of the visitors to Disneyland Paris are from Europe. I think Disney Village could definitely do with an Italian themed restaurant as well as a British themed restaurant. The Olive Garden restaurant chain, which specialises in Italian food, would definitely be a good fit for Disney Village. In terms of a British themed restaurant, I'm sure there could be a pub themed restaurant in the future. One can only hope! Well that brings things to an end for now. I hope you have enjoyed reading my answers to these questions. It's been a pleasure answering the questions. 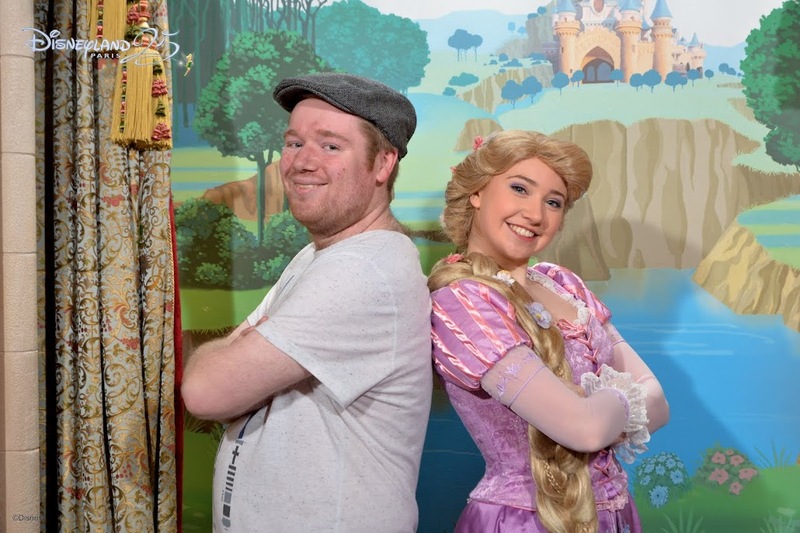 Always more than happy to answer your questions, especially as it gives me an excuse to write about Disneyland Paris once again, but then again, I never need an excuse to write about my favourite place in the world! Before I finish, I'd just like to give a special shout out to Immy Cousins and Jay Miles for their help with this blog. Much appreciated you two! I wish you a warm welcome to my blog Disney Village Fans! More Solo Trips & One Very Big Trip Next Year! I've been writing blogs ever since I studied media at college, back in 2010. Aside from my collage blogs, I have written a successful travel blog, specialising in theme parks, mostly Disney. I have also written blogs about my love for films and musicals. Recent years have seen me start up a Facebook group specialising in the Disney theme parks. I have also created a fun YouTube channel, showcasing all of my holiday vlogs. The Facebook group and YouTube channel are both called 'Disney Village Fans' if you fancy joining or subscribing!